The rapid development of the information society has accentuated the importance of digital divides, which refer to economic and social inequalities among populations due to differences in access to, use of, or knowledge of information and communication technologies (ICT). This book discusses the current state of digital divides, ranging from global challenges in universal access to new opportunities for greater digital inclusiveness (e-inclusion). The first part of the book illustrates current challenges and provides examples from emerging markets and developed countries alike. It covers digital divides facing a developing country like Ghana and the range of divides in large places like Australia, China, and Russia. It also discusses digital skill divides in Europe and the digital gender divide, which shows that there are more men online than women. 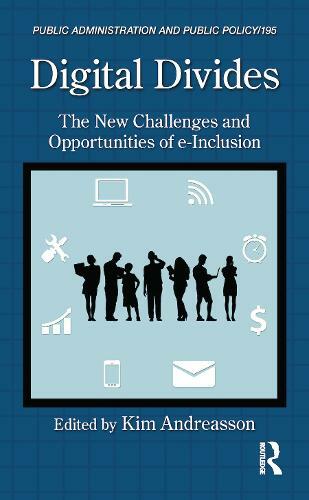 The second part of the book focuses on e-inclusion and describes recent efforts to bridge digital divides through a number of initiatives. It explores the inclusion programs in Singapore, the efforts in India to leverage mobile devices, and how a UK nongovernmental organization attempts to bridge existing gaps there. It also assesses programs in several countries that provide computers to youth. The book concludes with a view toward the future, including challenges in determining outcomes in ICT for development (ICT4D) and anticipated new divides. It introduces the cyber dependency matrix to illustrate where countries are in their journey toward an information society and what happens as they reach higher levels. Emerging concerns include a global information divide, courtesy of cyber security and data policies. "Twenty-five years after the introduction of the Internet, more people around the world are offline rather than online. Given the opportunities of a digital society, it is time to reassess old challenges to bridge the access gap and analyze emerging concerns towards greater e-inclusion. I'm pleased that Kim Andreasson, as an e-government adviser to the United Nations for more than a decade, helps to raise awareness of these issues and I am confident that the information contained within this volume will help to further bridge digital divides."